A smart-water expert details the impact of data and analytics on the water sector. It may be time to shed the quotes around the term “smart water.” When it was the water industry’s pipedream, so to speak, the buzzword-y connotation was appropriate. But smart water technology is now fully functional and greatly effective, at least where implemented, with a trajectory that is both ascending and inevitable. Or, as market intelligence firm Bluefield Research contends, smart water is here to stay. The prediction for profound impact comes from the many benefits, mostly geared toward improved efficiency, enabled by smart water technology. And while the transition to a proven, more-efficient water management system makes common sense, it is still far from commonplace among utilities. Smart water is here to stay, perhaps, but it nevertheless has a long way to go. So, in these still-nascent stages of a new era, you may have a number of questions about smart water technology basics, capabilities, operation, and obstacles. 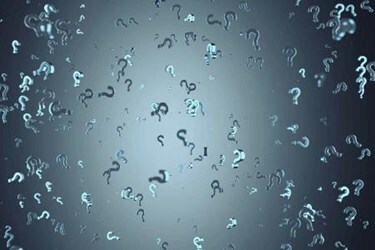 The following Q&A — a conversation with Will Maize, Bluefield’s senior analyst covering smart water applications and emerging technologies — provides some answers. How do you define smart water? There are a lot of varying definitions out there, but we define smart water as a group of emerging technology solutions that help water managers operate more effectively. These solutions harness state-of-the-art hardware and software to provide increasing levels of system intelligence, visibility, automation and control, and customer service. At Bluefield, we take a holistic approach to consider the entire spectrum of smart water solutions — from hardware (e.g., smart meters) to software solutions (e.g., data platforms). The aim is to improve customer and network management through new technologies, data-driven platforms, and more advanced business models. To give you an idea of scale, Bluefield forecasts the U.S. municipal water sector’s spend to surpass $20 billion on software, data, and analytics solutions over the next decade. It’s still early, so this could scale quickly. What is the problem that smart water solutions are attempting to solve? Historically, utilities have been hobbled by their inability to generate actionable insights from disparate network and water usage data, but this is changing with more advanced data management and cloud-based solutions. Water utilities have been stereotyped in the past as stodgy and never-changing, but this no longer holds true; smart water is bringing the water industry into the 21st century as companies look to adopt these cutting-edge solutions. Leveraging software to help utilities and consumers track their home water usage. Why is the industry turning to data and analytics now? There are a number of factors that are leading to somewhat of a perfect storm. First, there is more pressure than ever on utilities to do more with less. Consumers are pushing back on rising water rates and expecting better customer service. Utilities and municipalities find themselves facing mounting financial constraints driven by falling water revenues and pressure to address aging infrastructure. Approximately 50 percent of U.S. infrastructure has been evaluated as poor to beyond planned life, according to latest EPA reports. And companies are looking for new, innovative ways to address issues such as aging pipes and leakage management. This has sparked an uptick in demand for innovative solutions to more cost-effectively manage billing and customer management, leakage rates, and energy consumption. Water loss is a big concern, and states are attempting to increase regulations in this area. Water scarcity events have influenced the development of state-driven regulation targeting water loss. We have seen great advancements in the areas of Big Data and IoT, leading other industries, such as energy, to adopt these technologies. With pressing issues mounting, the water industry is now taking advantage as well. Can smart water technologies make a difference? The short answer is yes. The results have been significant. In some cases, smart water solutions have halved nonrevenue water — leaks and billing errors — and reduced energy consumption from 20 to 40 percent. As much as 30 percent of water utility operating expenditures can be improved almost immediately through more dynamic and real-time system monitoring, according to Bluefield’s analysis. What are the fastest-growing segments? Often the first step in U.S. utilities’ smart water journey is through smart water meters —automatic meter reading (AMR) or advanced metering infrastructure (AMI). Meters will continue to represent the lion’s share of forecasted expenditures at 82 percent from 2017 through 2026. The challenge, however, is that the data collected from these meters — if collected at all — needs to be managed and analyzed. This is where we see big improvements and opportunity. We are also seeing huge potential in two other areas: asset intelligence and leakage management. 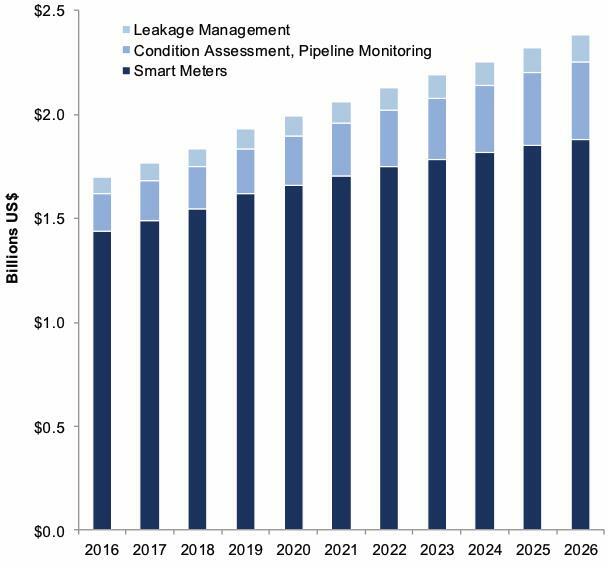 We predict that asset intelligence, including pipeline monitoring, asset condition inspections, and asset management will emerge as a key smart water segment as utilities seek efficiency under mounting pressure of operating and capital replacement budget stress. Over $2.7 billion will be directed towards asset condition assessment and pipeline monitoring through 2026, according to our analysis. Given the state of municipal infrastructure, there is a wealth of low-hanging opportunities for improvements. At the same time, operating expenditures on leakage management will total $1 billion through 2025 as smart solutions for leakage management, driven by fixed-network acoustic technologies, satellite leak detection, and improved real-time network intelligence, capture increased market share. "The bottom line is that the water industry has a huge need to be more efficient. And there are higher expectations than ever from customers that information networks be more sophisticated." Which companies or utilities are leading the charge? Smart water is bringing a wide range of new companies into the water industry from multiple sectors and value chain positions, which is fitting for an industry opening itself up to the massive potential. Seizing on this burgeoning demand for solutions is an outside group of venture-backed startups seeking to leverage their data expertise, much of which draws from other industry applications. These data and analytics companies are looking to integrate disparate sources of data to optimize networks, track water quality, and generate insights for asset performance management. Their primary challenge, however, will be overcoming a credibility gap with demonstrated pilot projects and buy-in from municipal utilities. These companies are not new to data and IoT, but many are new to the water industry. Since 2014, 42 acquisitions in smart water have exceeded $8.2 billion, reinforcing the growing confidence larger water companies are placing on water data and analytics as growth opportunities. We are seeing more diversified players like Honeywell, Trimble, and Xylem moving deeper into the sector. Early-adopting utilities, including American Water and East Bay Municipal Water District, are leading the shift towards smart water technology adoption. Market leaders, including Mueller and Itron, have moved downstream into communications, data management, and analytics, while recent market entries via acquisition will further reshape the competitive landscape. As a result, more than 40 companies in the U.S. are positioning to deploy state-of-the-art solutions to enable more advanced levels of system intelligence, real-time network visibility, energy efficiency, and customer management. We can also look to Europe as a model. European utilities are really at the forefront in driving this space — in the areas of energy efficiency, smart meters, and leakage management. What hurdles does the water industry face in adopting smart water technologies? Culture. This is killer to innovation and improvements. For so long, out of sight, out of mind was the modus operandi for utility operators. Today, however, a combination of drought, water quality events in Flint and Pittsburgh, and customer expectations for real-time data and knowledge are increasing the demands on the utilities. The solutions are not new, and water utilities also face some of the hurdles that other industries are confronting when it comes to Big Data and IoT. They must address key questions such as who owns the data — the utility, the homeowner, or the technology provider? What defines a smart utility? Which of these startups will be around in the next three to five years? There are issues to be worked out, but we are not that far off from consumers being able to see water usage alongside electricity usage — all from their smartphones. What would you say to skeptics who say smart water is just a fad? I would say that just a few years ago there was only a handful of hardware players. But now the market looks entirely different. We are seeing larger, diversified companies enter the fray, utilities reshaping their mindset, and Silicon Valley applying data expertise. This combination has huge potential to change the way the U.S. water industry works. Smart water is a big deal for the water industry and is here to stay. On the one hand, we are grappling with age-old issues of water infrastructure, pipes over 100 years old. At the same time, there are major technological advances that could revolutionize the water sector. The bottom line is that the water industry has a huge need to be more efficient. And there are higher expectations than ever from customers that information networks be more sophisticated. I don’t see any of this going away. If anything, there will be more players entering the market and more investment in this space. Where can our readers get more information on smart water?